Photo 07 is a photography show in Zurich, held once a year to highlight Swiss photographers and their work from that particular year. So, actually the name changes every year; Photo06, Photo07, Photo08, etc. 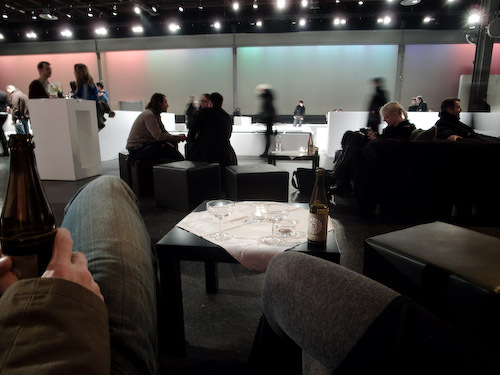 It generally takes place in the Maag Event Hall near Hardbrücke, the cool Zurich club district. In short, an old factory is rented out and hundreds of photos are put on display by the represented photographers for anyone interested. A pallet of Faces magazine was sitting unattended for pilfering, the same as you’re likely to find at a Kunsthaus-techno party or other art-type exhibition around Zurich. 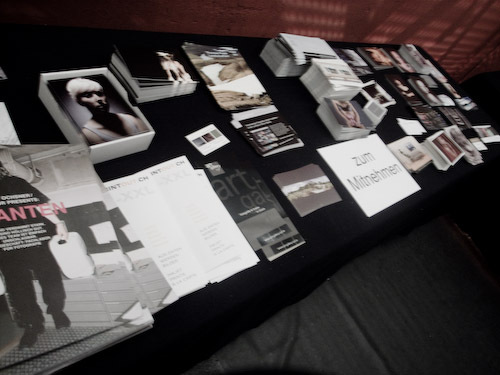 You can also grab free literature and promotional cards from the photographers. 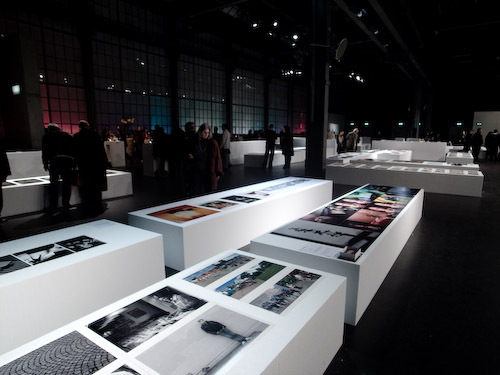 There’s no real theme for the iconic Zurich photo show, the only qualification being that the photographs were produced during the year of the show. This lends a broad subject matter, everything from photos that are “supposed” to be out of focus to tables bleeding black blood, fantastic aerial shots and high fashion. This also means there’s no pretentiousness about the presentation of the work. The goal of the night is to exhibit Swiss photography, network, hang-out, basically just chill and have a good inspiring time. The work of a high-paid fashion photographer can be found next to that of high-adrenaline hobbyist. It’s all about the images. Of course, because the show highlights the work more than the artist, I can’t remember a single name of anyone who exhibited at Photo07. So, it’s fortunate that a list of all of them can be found on the Photo07 site. There you can find the contact info for Sandor Rozsas, who can produce sharp photos if kindly asked. You can also find out about Oliver Oettli, who’s glamor works sometimes includes pink plastic dolls from IKEA. The actual presentation of the works is left up to their owners and might range from well-matted to frame-less prints seemingly freshly removed from the cutting room floor. 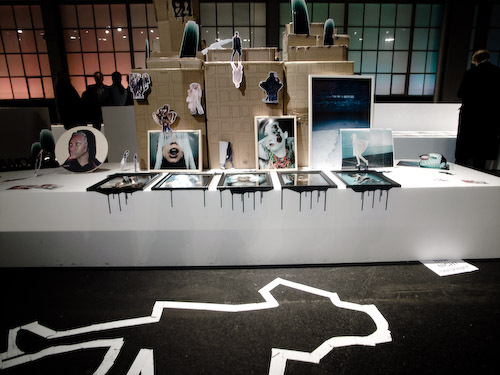 The display surface was uniformly white Styrofoam – cut into giant blocks, which fit nicely with the concrete flooring and dark industrial setting. The coolest and most enjoyable art is the type you can interact with. 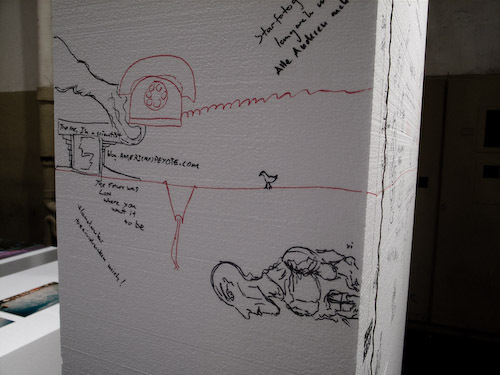 And one of the first exhibits was a giant foam column with a permanent marker on hand for every anonymous person to draw or write whatever they felt like. Naturally I produced a strange looking creature with large Alien-like head and human nose. After walking through the avant-foam maze of faces of colors you end up near on the other side of the cool-factory ambiance and can chill in the lounge – by the bar. The perfect setting to sit back and reflect on the experience you’ve just witnessed. Photo07 was a cool experience, situated conveniently in between Christmas and New Years, the show is an excellent reason to wander into the crisp December Zurich night. I’m looking forward to Photo 08 in Zurich, and might even submit a portfolio to the show. 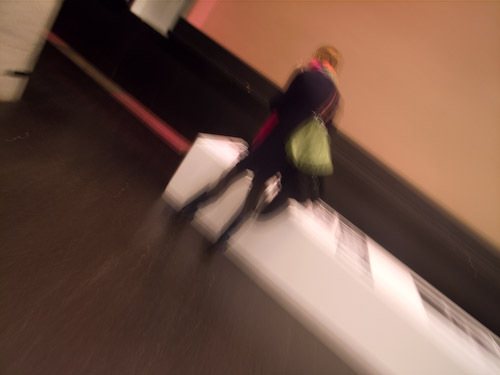 Hi Mark, I happened upon your blog while Googleing ¨Photography Zurich¨. I am a photographer straight out of college, just moved here from the states and would be very appreciative if you were able to give me some pointers on where to go, etc in order to get to know the photography scene in Zurich a little bit.